Learn more about Zander and Kevin Cannon, Comic Book Artists. [panel] Younger Kevin hand-drawing a cartoon at desk. Kevin: Kids are gonna love this Starr Report joke! [panel] Xander Jacobs ’96 leans around the corner of a building and catches Kevin's attention. Text: Okay, so my first strips weren't exactly a hit, but they caught the eye of a recent graduate... Xander: PSST!! Are you Zanders's brother? Kevin: Who??? [panel] Xander grins at a surprised Kevin. 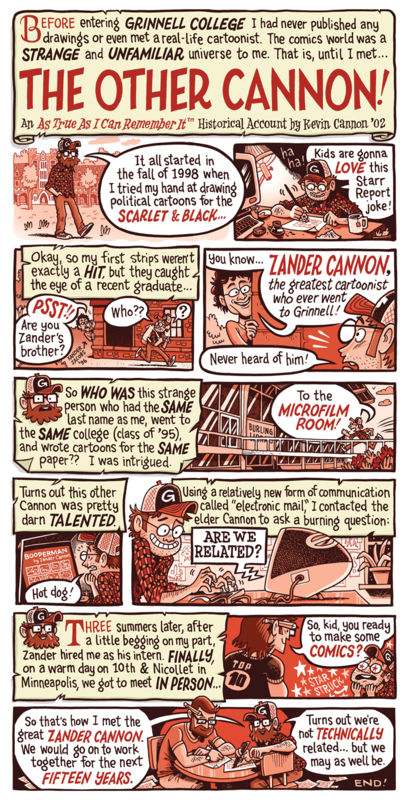 Xander: You know... Zander Cannon, the greatest cartoonist who ever went to Grinnell! Kevin: Never heard of him! [panel] Kevin dashes to Burling Library. Text: So who was this strange peron who had the same last name as me, went to the same college (class of ’95), and wrote cartoons for the same paper?? I was intrigued. Kevin: To the microfilm room!! [panel]Kevin looking at microfilm of old Booperman comics by Zander Cannon. Text: Turns out this other Cannon was pretty darn talented. Kevin: Hot dog! [panel] Kevin types a message on an old Macintosh computer, with pictures posted on the wall behind him. Text: Using a relatively new form of communication called "electronic mail," I contact the elder cannon to ask a burning question: Are we related? [panel] Star struck Kevin, with liberal stars in his eyes, meets Zander. Text: Three summers later, after a little begging on my part, Zander hired me as his intern. Finally, on a warm day on 10th & Nicollet in Minneapolis, we got to meet in person... Zander: So, kid, you ready to make some comics? [panel] Bearded Kevin and Zander sharing a table while drawing cartoons. So that's how I met the great Zander Cannon. We would go on to work together for the next fifteen years. Kevin: Turns out we're not technically related... but we may as well be.